An easy 2-ingredient recipe for how to make your own dark chocolate chips! They have all of the richness & none of the strange ingredients! Last May when I flew to Miami for the BlogHer Food conference, I started craving chocolate chip cookies. Something about traveling triggers that craving (don’t ask me why! ), so during my layover in Houston, I wandered around the terminal looking for a bakery or sandwich shop that offered treats. I stumbled upon a stall not too far from my departure gate and walked up to the counter to ask the server whether any of their jumbo chocolate chip cookies were soft and chewy. In my world, that’s exactly how they should be—not crisp, crunchy, or stale! Because the individual cookies were firmly wrapped in plastic, she kindly prodded each one for me before handing over the one that felt the softest. After giving her my money, I happily strolled down the walkway back to the gate to slowly enjoy my treat while waiting for the plane to arrive. While I nibbled, I wondered about how chocolate chips were made. There were hundreds (okay, not really, but it looked like it!) of miniature ones studded throughout the cookie, but I completely forgot about that thought until my friend Lee posted her recipe for DIY vegan chocolate chips a few weeks ago. 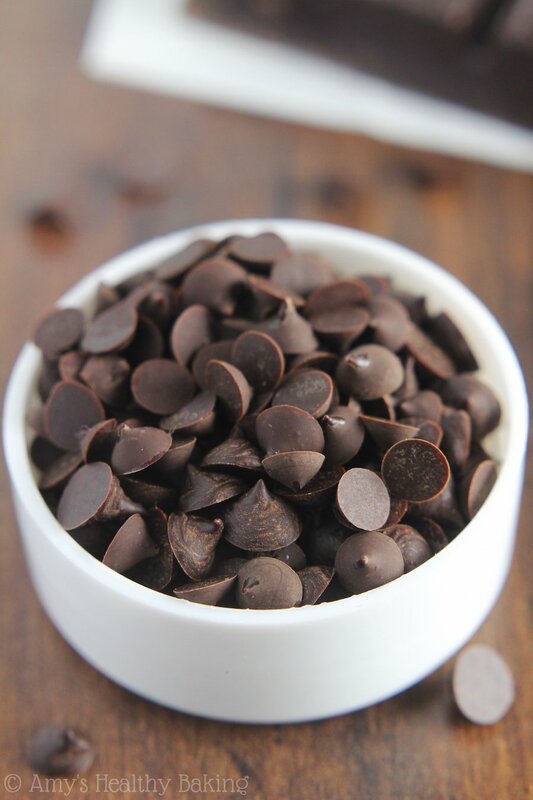 That inspired me to try making my own, so today I’m share how to make Homemade Dark Chocolate Chips! 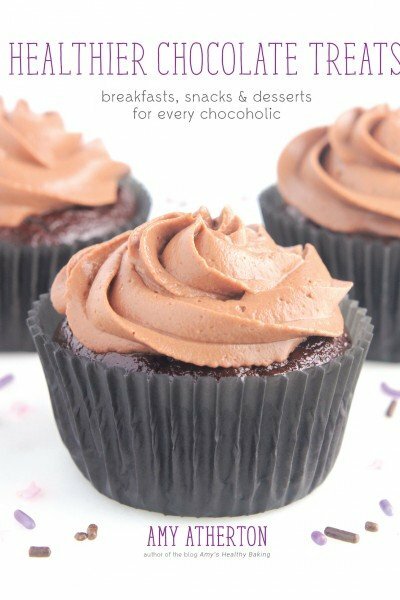 I wanted to come up with a really easy recipe, so I narrowed this down to just 2 ingredients: unsweetened chocolate and sweetener. 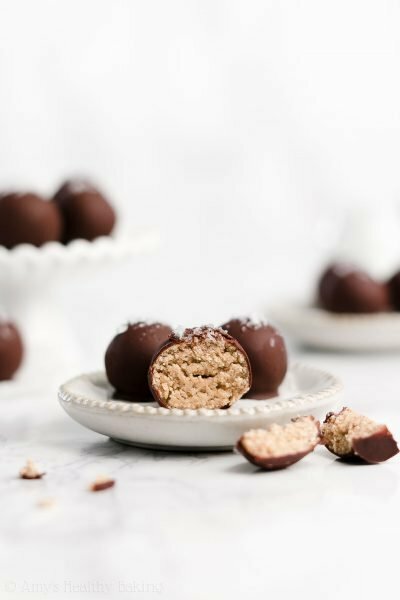 In order to make these healthier than store-bought, it’s really important to start with 100% unsweetened baking chocolate. The only ingredient on the label should be “chocolate.” Both Baker’s and Ghirardelli sell 4-ounce bars, and I love and use both of them. For the sweetener, I chose Truvia. 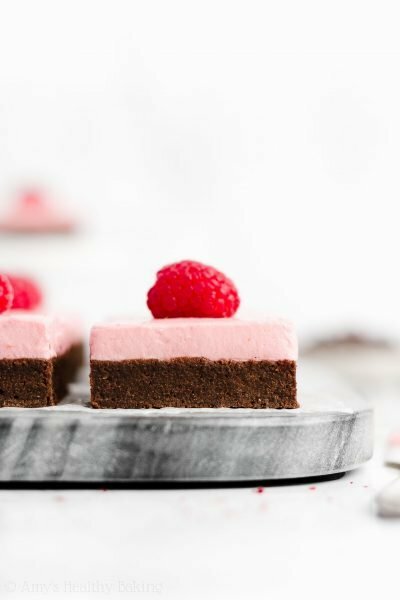 It’s my favorite sugar-free sweetener and one I always stock in my pantry. However, its crystalline form doesn’t quite dissolve, so these chocolate chips are slightly more grainy that store-bought. 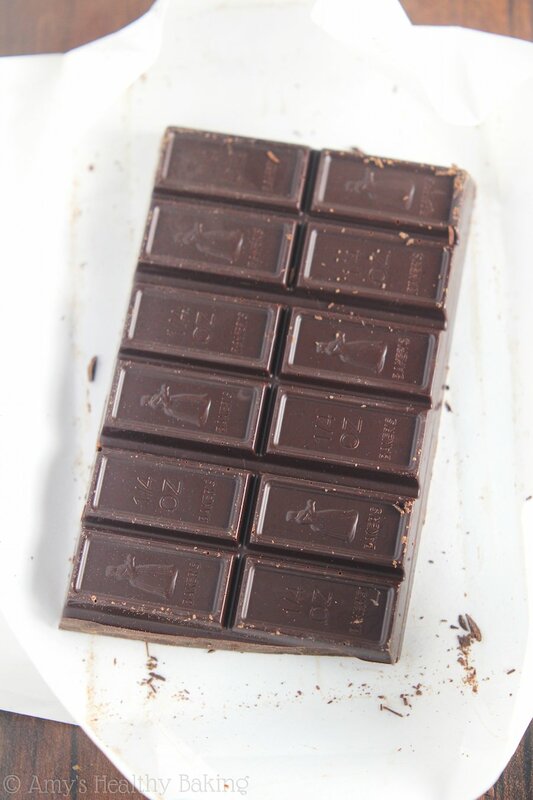 If you prefer a smoother chocolate, try powdered Stevia or agave instead. So all you need to do is melt the chocolate, stir in the sweetener, and pipe little dots using a zip-topped bag with the corner snipped off. You want the chocolate to still be warm when you start piping. As it cools, the ensuing chocolate chips will began to have what looks like a light brown coating dusted on them. That’s okay! Those chips will still taste the same; they just look a little different. When you first start piping, the chocolate chips won’t hold their tips. They’ll look more like dots or round blobs. Once you’ve piped about half of the chocolate, take a toothpick (or just use the tip of your finger!) and lightly touched the center of the dot; then lift up. This reforms the iconic tip, but it’s totally optional. If you don’t care how they look, then leave them as dots! Of course, I had to test out how these Homemade Dark Chocolate Chips actually worked in cookies… Which was incredibly hard because I just wanted to eat them all. But I managed to save enough, so stayed tuned! These chocolate chips are really dark and indulgent. 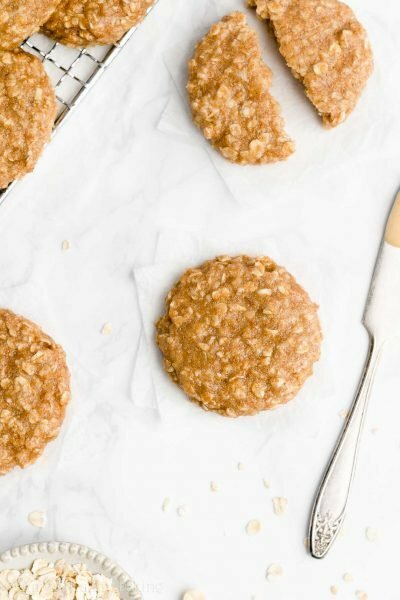 Use them in your favorite cookie recipe, or sneak some as a snack! 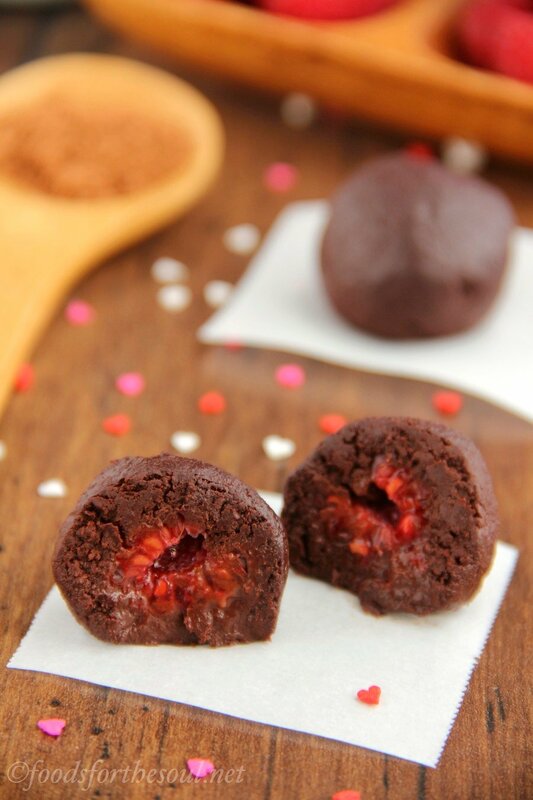 Add the chocolate to a microwave-safe bowl. Microwave on HIGH for 20 seconds. Stir for at least 2 minutes. If the chocolate is still not completely melted, microwave on HIGH for 5 seconds; then stir for another 2 minutes. Continue until the chocolate is completely melted. Stir in the Truvia. Microwave the chocolate mixture on HIGH for 6 seconds. Spoon it into a small zip-topped bag. Snip off one corner, and pipe dots onto the prepared parchment paper. 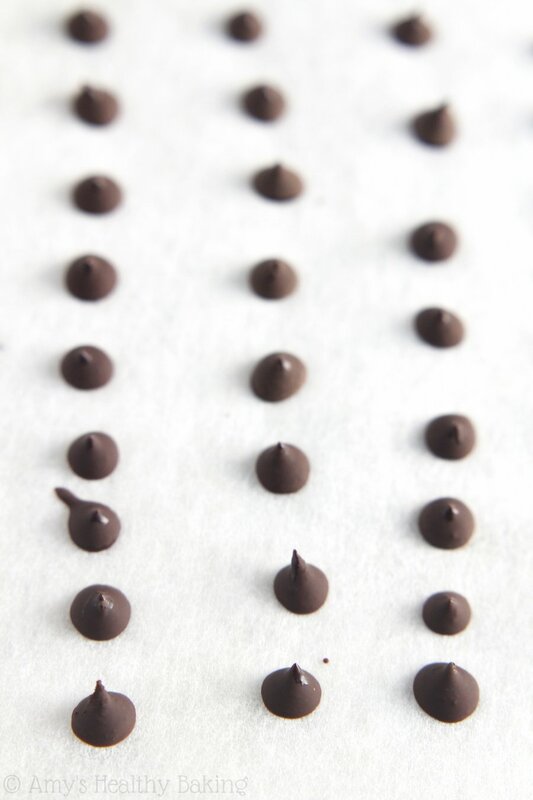 After piping about half of the chocolate mixture, gently touch a toothpick (or your clean, dry fingertip) into the center of each dot, and lift it up to create the iconic point. Continue with the remaining chocolate. 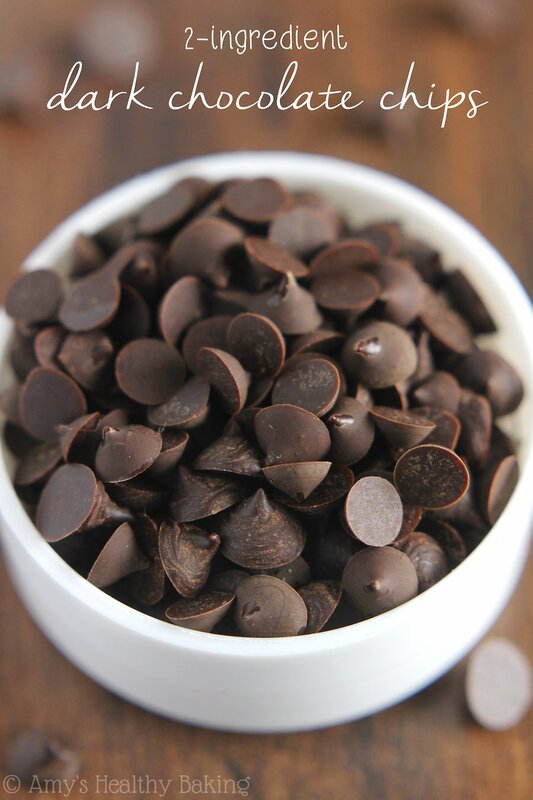 Let the chocolate chips harden completely before transferring them to an airtight container. Notes: I recommend starting with the measurements above before increasing the recipe. 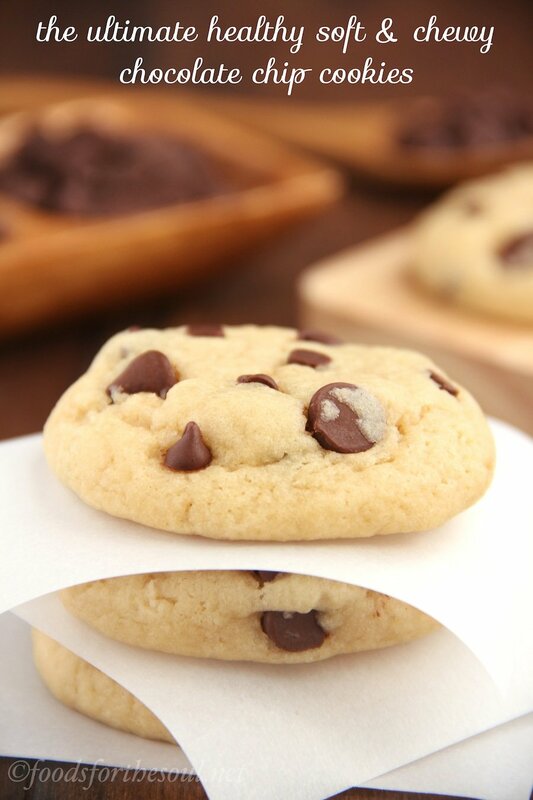 It’s possible to double, triple, or quadruple the recipe, but you’ll need to work quickly to avoid the chocolate hardening before it’s piped onto the parchment paper. For the unsweetened baking chocolate, I recommend Ghirardelli or Baker’s bars. 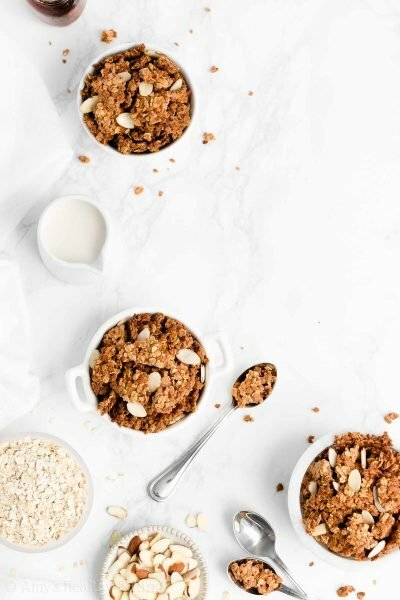 Powdered Stevia may be substituted in place of the Truvia for a smoother, less grainy texture. Agave may work as well, although I haven’t tested it myself. Has anyone tried Lakanto (Monk Fruit) liquid sweetener in Baker’s or Ghirardelli unsweetened chocolate? Or sugar-free jello (I think the Black Cherry might go together well)? I haven’t tried either one! I don’t recommend using sugar-free jello because that will probably affect the texture too much, and I can’t guarantee it’ll dissolve properly. I think the Lakanto liquid sweetener should work though! 🙂 I’d love to hear what you think if you try these homemade chocolate chips Melanie! Hello Amy! I’m so glad you shared this recipe and I’m eager to make it but I’m not sure if my ingredients would work. I have regular dark chocolate, and I don’t think if its “baking chocolate”. Will I still get the same results? Also, what are alternatives for the sweetener? Thanks! I really appreciate your interest in my recipe, Anna! Check the label of your dark chocolate. 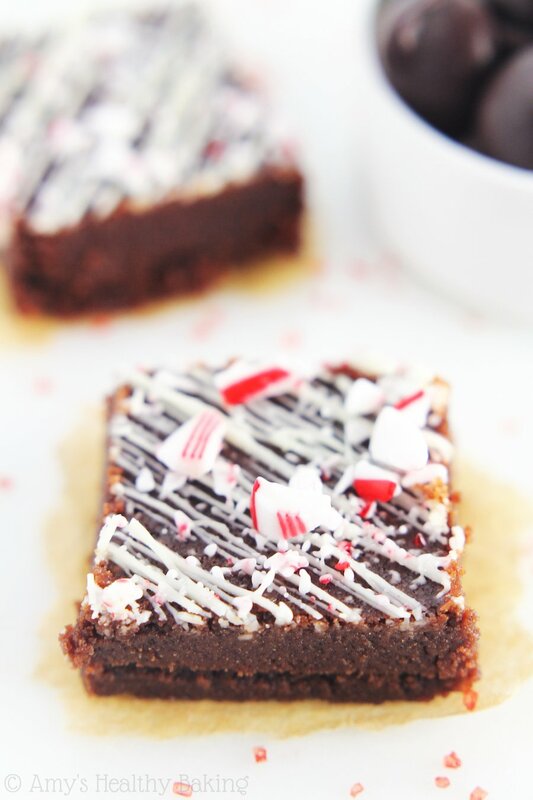 If there’s only one ingredient (chocolate), then it’s what I used in this recipe. If it has other ingredients (like sugar, cocoa powder, cocoa butter, and/or chocolate liquor, etc), then it’s not the type I used. However! If you like the flavor of your regular dark chocolate and don’t think it tastes too dark, then you can just use that and omit the sweetener. 🙂 I’ve actually shared other sweetener alternatives in many of the comments above yours, so I recommend checking there! 😉 I’d love to hear what you think if you make these homemade chocolate chips! – Are the homemade choco chips, bake stable? I mean it did not melt during the mixing and baking process? 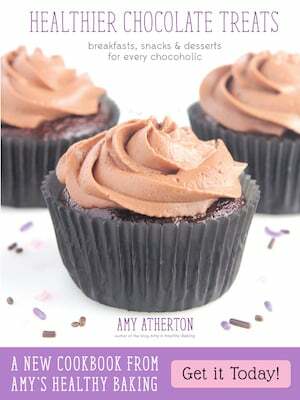 – Do I need to chill the chocolate chips? – Will the DIY choco chips stay in form on room temp? I really appreciate your interest in my recipe! To answer your questions: yes, no, and yes! You can see how I used them in this cookie recipe, and they definitely held their shape. 🙂 I can’t wait to hear what you think of them! If you melt chocolate then it just rehardens isnt that just melting and reheating? Don’t you want to learn how to make it solid yourself? Not reheating? Just my opinion i was looking online how to make not reheat like leftovers. Thank you very much for thinking up this way of making chocolate chips! I made it with maple syrup, I didn’t have any thing else. They are strong-tasting! Of dark chocolate, that is 🙂 Baker’s unsweetened is the chocolate I used. I found the process to be simple and easy, just not as pretty as yours 😉 I will be on the lookout for agave. 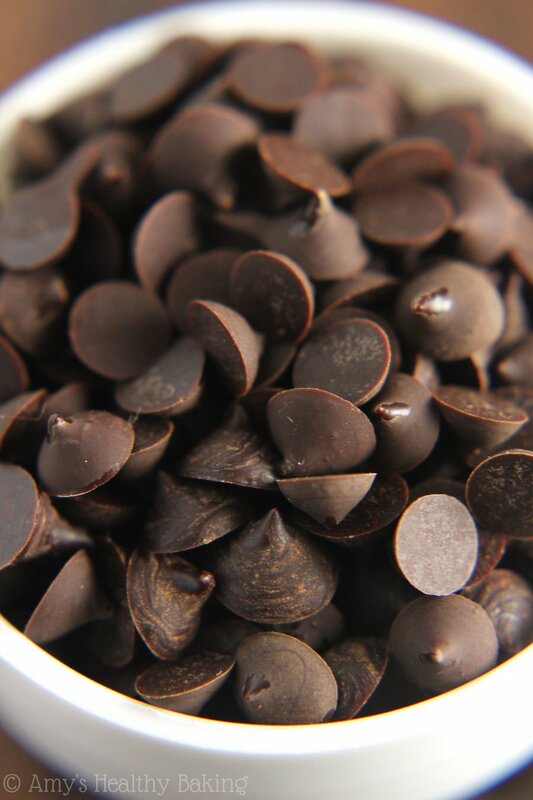 Thank you again, I will be using these chocolate chips in the Black Bean Brownies recipe.